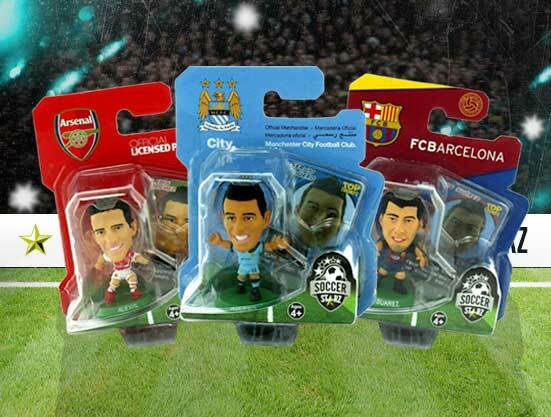 SoccerStarz blister packs contain a single figure. Who will you choose? The 2016 SoccerStarz range of single figure Blister Packs are available now featuring over 300 players from your favourite teams! These include new sculpts and newly transferred players such as; Chelsea’s Kurt Zouma, Man City’s Raheem Sterling, PSG’s Di Maria and of course Spurs’ Harry Kane plus all the big stars in their new kits like Alexis Sanchez, Lionel Messi, Sergio Aguero and Cristiano Ronaldo plus many more! 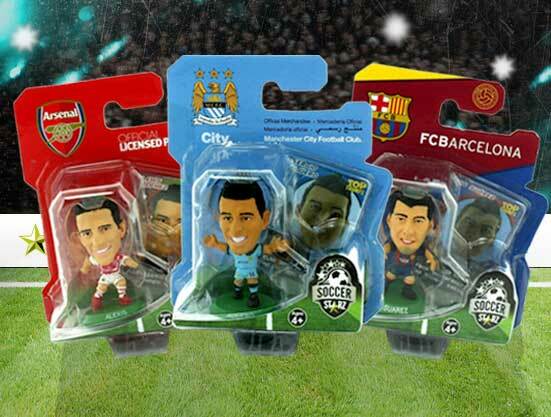 You can collect SoccerStarz from 15 of the 20 teams in the Premier League and top clubs from the European Leagues! There are also over 25 players in away kits to add to your SoccerStarz collection! Don’t forget that a cool, collectable Mini Top Trumps cards is featured in SoccerStarz blister packs from the following teams: Arsenal, Barcelona, Borussia Dortmund, Chelsea, Liverpool, Manchester City and Tottenham Hotspur. Listed below are the players in the 2016 range of blister packs out now or due for release in the coming weeks with their SOC numbers! SOC020 Jack Wilshere Out Now! SOC021 Mikel Arteta Out Now! SOC024 Theo Walcott Out Now! SOC072 Aaron Ramsey Out Now! SOC074 Alex Oxlade-Chamberlain Out Now! SOC075 Laurent Koscielny Out Now! SOC114 Olivier Giroud Coming Soon! SOC115 Santi Cazorla Out Now! SOC223 Arsene Wenger Out Now! SOC400 Per Mertesacker Out Now! SOC416 Mesut Ozil Out Now! SOC670 Kieran Gibbs Coming Soon! SOC763 Alexis Sanchez Out Now! SOC804 Mathieu Debuchy Out Now! SOC851 Danny Welbeck Out Now! SOC935 Petr Cech Out Now! SOC732 Joao Moutinho Out Now! SOC733 Jeremy Toulalan Out Now! SOC246 Ciaran Clark Out Now! SOC249 Ashley Westwood Out Now! SOC883 Alan Hutton Out Now! SOC895 Kieran Richardson Coming Soon! SOC930 Micah Richards Out Now! SOC099 Gerard Pique Coming Soon! SOC101 Andres Iniesta Coming Soon! SOC103 Lionel Messi Out Now! SOC105 Dani Alves Out Now! SOC401 Neymar Jr Out Now! SOC727 Marc Bartra Out Now! SOC728 Marc-Andre Ter Stegen Coming Soon! SOC744 Ivan Rakitic Coming Soon! SOC745 Javier Mascherano Coming Soon! SOC764 Luis Suarez Out Now! SOC776 Lionel Messi **AWAY KIT** Out Now! SOC796 Claudio Bravo Out Now! SOC823 Thomas Vermaelen Out Now! SOC884 Jeremy Mathieu Out Now! SOC905 Luis Suarez **AWAY KIT** Coming Soon! SOC907 Sergio Busquets **AWAY KIT** Coming Soon! SOC675 Henrikh Mkhitaryan Out Now! SOC677 Pierre-Emerick Aubameyang Out Now! SOC678 Roman Weidenfeller Out Now! SOC679 Sven Bender Out Now! SOC680 Mats Hummels Out Now! SOC681 Marcel Schmelzer Out Now! SOC682 Marco Reus Coming Soon! SOC703 Nuri Sahin Out Now! SOC840 Shinji Kagawa Out Now! SOC879 Erik Durm Out Now! SOC880 Jakub Błaszczykowski Out Now! SOC881 Lukasz Piszczek Out Now! SOC882 Neven Subotic Out Now! SOC936 Ilkay Gundogan Out Now! SOC140 Anthony Stokes Out Now! SOC141 Charlie Mulgrew Out Now! SOC142 Emilio Izaguirre Out Now! SOC145 James Forrest Out Now! SOC148 Scott Brown Out Now! SOC691 Kris Commons Out Now! SOC698 Leigh Griffiths Out Now! SOC885 Craig Gordon Out Now! SOC011 John Terry Out Now! SOC046 Gary Cahill Out Now! SOC047 Branislav Ivanovic Out Now! SOC221 Cesar Azpilicueta Out Now! SOC406 Jose Mourinho Out Now! SOC659 Nemanja Matic Out Now! SOC710 Cesc Fabregas Out Now! SOC714 Thibaut Courtois Out Now! SOC719 Diego Costa Out Now! SOC780 Cesc Fabregas **AWAY KIT** Out Now! SOC781 Eden Hazard **AWAY KIT** Coming Soon! SOC783 John Terry **AWAY KIT** Out Now! SOC820 Diego Costa **AWAY KIT** Out Now! SOC832 Oscar **AWAY KIT** Out Now! SOC886 Juan Cuadrado Coming Soon! SOC887 Kurt Zouma Out Now! SOC908 Nemanja Matic **AWAY KIT** Out Now! SOC909 Willian **AWAY KIT** Out Now! SOC751 Joel Ward Out Now! SOC752 Mile Jedinak Out Now! SOC888 Alan Pardew Out Now! SOC940 Yohan Cabaye Out Now! SOC261 Tim Howard Out Now! SOC262 Leighton Baines Out Now! SOC263 Phil Jagielka Out Now! SOC264 Seamus Coleman Out Now! SOC266 Leon Osman Out Now! SOC267 Steven Pienaar Out Now! SOC269 Steven Naismith Out Now! SOC270 Kevin Mirallas Out Now! SOC272 Darron Gibson Out Now! SOC439 Arouna Kone Coming Soon! SOC485 James McCarthy Out Now! SOC513 Romelu Lukaku Out Now! SOC648 Roberto Martinez Out Now! SOC731 John Stones Out Now! SOC746 Gareth Barry Out Now! SOC988 Aaron Lennon Coming Soon! SOC112 Martin Skrtel Out Now! SOC193 Joe Allen Out Now! SOC194 Lucas Leiva Out Now! SOC240 Daniel Sturridge Out Now! SOC357 Philippe Coutinho Out Now! SOC403 Simon Mignolet Out Now! SOC441 Kolo Toure Coming Soon! SOC672 Jordan Henderson Coming Soon! SOC699 Brendan Rodgers Out Now! SOC740 Adam Lallana Out Now! SOC765 Lazar Markovic Coming Soon! SOC825 Dejan Lovren Out Now! SOC899 Divock Origi Out Now! SOC917 Emre Can Out Now! SOC923 James Milner Out Now! SOC970 Christian Benteke Out Now! SOC225 Joe Hart Out Now! SOC226 Vincent Kompany Out Now! SOC228 Yaya Toure Out Now! SOC229 David Silva Out Now! SOC231 Samir Nasri Out Now! SOC233 Sergio Aguero Out Now! SOC287 Pablo Zabaleta Out Now! SOC374 Sergio Aguero **AWAY KIT** Out Now! SOC443 Jesus Navas Out Now! SOC444 Gael Clichy Out Now! SOC701 Manuel Pellegrini Out Now! SOC735 Bacary Sagna Out Now! SOC824 Eliaquim Mangala Out Now! SOC896 Wilfried Bony Out Now! SOC944 Raheem Sterling Out Now! SOC971 Fabian Delph Out Now! SOC985 Kevin De Bruyne Out Now! SOC169 Fabricio Coloccini Out Now! SOC292 Steven Taylor Out Now! SOC293 Moussa Sissoko Out Now! SOC294 Vurnon Anita Out Now! SOC295 Yoan Gouffran Out Now! SOC709 Steve Mandanda Out Now! SOC748 Nicolas N'Koulou Out Now! SOC755 Alaixys Romao Out Now! SOC761 Michy Batshuayi Out Now! SOC296 Salvatore Sirigu Out Now! SOC298 Thiago Silva Out Now! SOC301 Lucas Moura Out Now! SOC302 Javier Pastore Out Now! SOC303 Blaise Matuidi Out Now! SOC307 Zlatan Ibrahimovic Out Now! SOC422 Edinson Cavani Out Now! SOC499 Marco Verratti Out Now! SOC501 Thiago Motta Out Now! SOC694 Laurent Blanc Out Now! SOC711 David Luiz Coming Soon! SOC790 Zlatan Ibrahimovic **AWAY KIT** Out Now! SOC914 David Luiz **AWAY KIT** Out Now! SOC915 Thiago Silva **AWAY KIT** Out Now! SOC980 Angel Di Maria Out Now! SOC890 Yacine Brahimi Out Now! SOC945 Iker Casillas Coming Soon! SOC477 Cammy Bell Out Now! SOC479 Lee Wallace Out Now! SOC480 Nicky Law Out Now! SOC493 Fraser Aird Out Now! SOC737 Kenny Miller Out Now! SOC120 Sergio Ramos Out Now! SOC126 Cristiano Ronaldo Out Now! SOC127 Karim Benzema Out Now! SOC130 Marcelo Vieira Out Now! SOC163 Luka Modric Out Now! SOC380 Sergio Ramos **AWAY KIT** Out Now! SOC421 Gareth Bale Out Now! SOC454 Raphael Varane Out Now! SOC695 Jese Rodriguez Out Now! SOC724 Daniel Carvajal Out Now! SOC766 Toni Kroos Out Now! SOC791 Cristiano Ronaldo **AWAY KIT** Out Now! SOC812 James Rodriguez Coming Soon! SOC916 James Rodriguez **AWAY KIT** Coming Soon! SOC206 Mark Hughes Out Now! SOC317 Jonathan Walters Out Now! SOC942 Glen Johnson Out Now! SOC938 Adam Matthews Out Now! SOC969 Younes Kaboul Out Now! SOC330 Wayne Routledge Out Now! SOC392 Ashley Williams Out Now! SOC395 Neil Taylor Out Now! SOC696 Jonjo Shelvey Out Now! SOC742 Lukasz Fabianski Out Now! SOC816 Gylfi Sigurdsson Out Now! SOC891 Jefferson Montero Out Now! SOC087 Kyle Walker Out Now! SOC095 Jan Vertonghen Out Now! SOC200 Hugo Lloris Out Now! SOC202 Moussa Dembele Out Now! SOC507 Christian Eriksen Out Now! SOC646 Nacer Chadli Out Now! SOC806 Ben Davies Out Now! SOC892 Harry Kane Out Now! SOC939 Toby Alderweireld Out Now! SOC878 Tony Pulis Out Now! SOC346 James Tomkins Out Now! SOC347 James Collins Out Now! SOC348 Winston Reid Out Now! SOC353 Mark Noble Out Now! SOC749 Mauro Zarate Out Now! SOC808 Enner Valencia Out Now! SOC894 Diafra Sakho Out Now! SOC933 Dimitri Payet Coming Soon! SOC966 Carl Jenkinson Out Now! SOC987 Nikica Jelavic Out Now!